Having a broad understanding of the principles, process and issues that can arise when building a track should help when dealing with contractors. Here are some basic race construction principles to follow. Track surfacing and formation. Ensure the camber is between 3-8%, and that the paddock side is fenced off if there are drains beside the track. A good track is constructed in layers. A foundation, or base layer, is formed with a surface, or wearing layer, placed on top. The base layer provides the structural support for the surface layer – if it is weak the surface layer may break up and collapse. If water can penetrate into the base layer it may lose its strength resulting in potholes. The surface layer has two functions: to provide a comfortable surface for cows to walk on and to shed water to protect the structural integrity of the track. Each layer should be thoroughly mechanically compacted using vibrating rollers. Loose, open layers have much less strength than well-consolidated ones. Cow traffic does not provide an adequate substitute for mechanical compaction. Topsoil and grass are not suitable for use in the base layer and should be removed before beginning construction. The base should be made up of layers, each up to 150 mm deep. After each 150mm layer is laid, it should be firmly compacted before the next is added. Moist sub-surface soil is a suitable material. Material dug out to make effluent ponds or the material removed from the table drains may be used, provided it is not topsoil. Use gravels, pit metal, or rotten rock but not river gravel. Soft clay is unsuitable for use in foundations unless stabilised with other materials. Hydrated lime, evenly spread and uniformly incorporated to a depth of 125mm, will allow soft clays to become stable once compacted. Cement can be used as a stabiliser in base layers – the usual recommendation is 1-4% of the total. If the material available does not create a satisfactory foundation, it is possible to use a ‘geotextile’ (an industrial fabric used in earthworks) to cover the shaped based layer, before adding the surface layer. Geotextiles allow water to pass through but they hold soil and rock in place and will prevent the surface layer from being pushed into the foundation layer, particularly by heavy traffic. The creation of a satisfactory track surface requires compaction into a hard, smooth, wear resistant layer, with a minimum of particles that can cut or bruise feet. It should be 100 – 150 mm thick. Topsoil and grass provide a soft cushioned surface for cows to walk on but are unable to withstand the rigours of frequent use. The surface layer is usually made from a mixture of fine materials – often sand, pumice, limestone, sandstone, woodchips, small stones and clay. Crushed limestone (5-6 mm) – check local lime for suitability. It is generally spread as a 50-100 mm layer and needs firm compaction. Sand alone does not make an ideal surface – it is abrasive on cows’ feet and washes away too readily. Well rounded gravel, less than 25 mm in diameter, is preferable to large stones. Large stones can be kicked aside, leaving the surface susceptible to water penetration and damage. Fine particles of clay will fill the gaps between larger particles, binding it together. It also gives the surface a long wearing and smooth finish. Incorporating 0.3-1% cement into the clay capping mixture can help stabilise the surface and prolong its life. Volcanic rock with a clay component that binds well to form a solid compacted surface. Excellent track maintenance is required when using this material to ensure there are no sharp stones at the surface. An experienced contractor should be used to lay and maintain this surface. Several screened options are available (40mm, 0-80mm and 80mm), but will vary according to region. The higher the calcium carbonate content the better the lime is as a track surface. Water does not need to be added when laying, if the lime has a naturally high moisture level. As with all track surfaces, a limed track required good maintenance. This material should not be applied to tracks less than 100 metres from the dairy because small stone chips get transported onto the hard concrete of the yeards and cause bruising and sole penetrations. It should be only added as a fine layer on top of other base material. Crusher dust should not be applied thickly as it will impede track drainage. To check if a material is appropriate for a top surface, a small sample rock should shatter under the heel of your gumboot when ground against a concrete surface. Trialling small loads of proposed materials will show which are going to work and which are not. 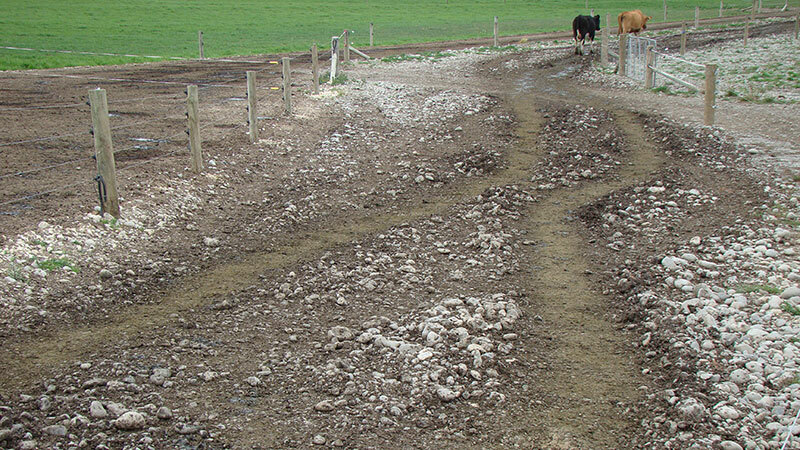 Concrete tracks can be useful in areas of high rainfall as they provide a clean track and reduce mud on udders. 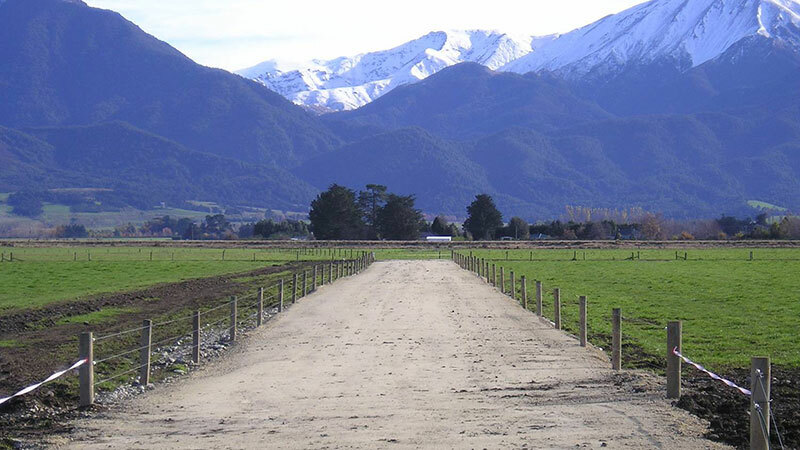 However they do require management at the boundary between the concrete and paddocks. A section of lime fines at the intersection can help stones fall off before they get on to the concrete. A track on a steep slope can mean water runs down the lane before running off the side – resulting in long water scours in the surface layer. Ideally, design tracks to minimise slope, even if it adds distance it will be worthwhile as maintenance issues will be reduced. Creating table drains at the sides of the track helps to take water away, maintaining track condition. The recommended size for table drains is 300 mm deep and 1 metre wide. Spur drains should be installed every 40 to 80 metres to empty the table drains on to paddocks - not to a watercourse. Spur drains should be closer together on steeper slopes. Small lateral drains should be cut into the tracks to allow water to flow away. Not all of the grassy edge should be removed as this is necessary to maintain the structure of the track. Adequate water table depth is essential to good drainage - ensure the water table is a least 600 mm below the surface to aid the draining of water away from the track. A water table close to the surface will hinder drainage and may cause the track to become wet, reducing its structural integrity and increasing its chance of collapse. It may be necessary to build your track above the paddock level in areas with a high water table to ensure drainage occurs.